Reliability-based Lubrication (RbL) isn’t just about lubricants. It’s a powerful combination of knowledgeable people, targeted products and services and customized solutions for your equipment. Chevron’s RbL and ISOCLEAN Services are a comprehensive, proactive approach to achieving lubrication excellence that helps you add value to your business and achieve your financial goals. Particle contamination is the number one cause of hydraulic system failures, and it is estimated that 82% of component wear is particle-induced. Worse, particles in contaminated lubricants can stop equipment by damaging the individual components that keep equipment running. Money spent repairing the effect of particle contamination is time and money lost. 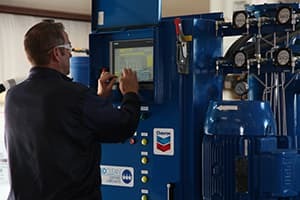 Chevron's ISOCLEAN Certified Lubricants Program combines a new lubricant product line and an innovative first-in-industry fluid cleanliness certification program to help customers reduce particle contamination in new lubricants. These lubricants are specially filtered to match the OEM's cleanliness recommendations and ISO cleanliness codes. Hampel Oil, as an ISOCLEAN Certified Lubricant Marketer, has taken significant steps to help its customers increase their productivity with the numerous benefits that ISOCLEAN products provide. For more information contact John McQuery (LubeEngineer) at john.mcquery@hampeloil.com or (316) 258-2937 or Rick Hageman (Strategic Account Manager) at rick.hageman@hampeloil.com or (316) 640-8536.